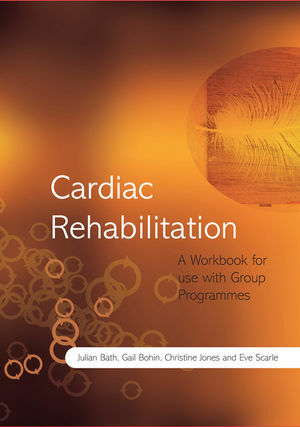 This easy-to-use manual provides a practical framework for a multi-disciplinary team to deliver a successful cardiac rehabilitation programme. Julian Bath is a consultant health psychologist based at Gloucestershire Royal Hospital, and manager of the Gloucestershire Cardiac Rehabilitation Psychology Service. He has a wealth of experience working clinically with groups and individuals in cardiac rehabilitation, and a wide range of clinical, consultancy and research experience in diabetes, rheumatology and renal care. Gail Bohin is a clinical psychologist with Gloucestershire Cardiac Rehabilitation Service. Whilst Dr. Bohin’s specialist area is cardiac psychology, she also has an interest in health behaviour change and obesity, and provides teaching and consultancy in both areas. In addition to contributing to the multidisciplinary rehabilitation group programme, she also provides individual therapy for cardiac patients. Christine Jones is a Cardiac Rehabilitation Specialist Nurse with nearly twenty years’ experience of working with cardiac patients. Christine has a keen interest in ICDs, and is the arrhythmia link nurse for Gloucestershire Cardiac Rehabilitation Service. Eve Scarle is a physiotherapist and Lecturer in Sport and Physical Activity at the University of Gloucestershire. Eve has a keen interest in exercise referral and has been instrumental in setting up such schemes for the University. She also works for BACR as a course director and assessor for the Phase IV exercise instructor’s course. Abbreviations Used in This Book. Chapter 1: Multidisciplinary Cardiac Rehabilitation. Recent evidence for the efficacy of cardiac rehabilitation. Comprehensive cardiac rehabilitation in Gloucestershire. The British Association for Cardiac Rehabilitation Standards and Core Components for Cardiac Rehabilitation (2007). Chapter 2: The Cardiac Rehabilitation Programme in Gloucestershire. Where the CR service is delivered. What does CR look like in Gloucestershire? The Individual CR Psychology Service. Attendance at CR in Gloucestershire. Professional development of the CR team. Psychological factors and health outcomes. Illness perceptions and cardiac events. Applying psychological theory in CR. Chapter 3: The Exercise Programme. Chapter 4: Preparing for the First Session. Eligibility for CR group programmes. Health, safety and essential equipment. Chapter 5: Coronary Heart Disease, Psychology and Exercise (Week 1). 1. Introduction to the Cardiac Rehabilitation Programme. 2. Coronary Heart Disease and its Risk Factors. Heart attack (or myocardial infarction). The risk factors for coronary heart disease. 3. The Psychological Side of Having a Cardiac Event. The solution: goal-setting and pacing. Monitoring the intensity of exercise. Rate of Perceived Exertion/Exercise Scale. Chapter 6: Aerobic Exercise and Stress (Week 2). 1. Exercise: What Sort and How Much? Exercise—what sort and how much? 3. Stress and Coronary Heart Disease. Prolonged stress and coronary heart disease. The gradual build-up of stress. When stress becomes a problem. Chapter 7: Warming Up, Cooling Down, Angina and Hypertension (Week 3). 1. Warm Up and Cool Down. How do we cool down? What do you do if you are having angina? 4. High Blood Pressure (Hypertension). How can we lower our blood pressure? Chapter 8: Activities to Avoid, Making Changes for Life and Cholesterol (Week 4). 1. Activities to Avoid at the Moment. What would we regard as heavy lifting? 3. Mind and Body Relaxation. 4. Making Changes for Life. Why make changes for life? Setbacks and maintaining behaviour change. What should our cholesterol level be? How to lower and improve our cholesterol levels. Chapter 9: Enough or Too Much Exercise? Diet and Coronary Heart Disease (Week 5). 1. Enough or Too Much Exercise? 3. Diet and Coronary Heart Disease. Chapter 10: The Benefits of Regular Exercise and Making the Most of your Recovery (Week 6). 1. The Benefits of Regular Exercise. 3. Making the Most of Your Recovery. Chapter 11: Staying Fit, Cardiac Medication and the Future! (Week 7). 1. How to Stay Fit for Life. How to recognise that your exercise levels need to be increased. How to keep motivated to exercise regularly. BACR Phase IV exercise instructor courses. Appendix 2: Letter of Invitation.